Researchers at the University of Calgary found that amino acid residues form a type of barrier to help in the process of electron transfer between proteins. "This raises the bar for biomolecular modeling," says Dennis Salahub, U of C co-author of a paper published today in the prestigious journal Proceedings of the National Academy of Sciences (PNAS). "At a fundamental level, it is by far the most detailed insight that has been obtained for the dynamic role of water in this kind of electron transfer, or for that matter any biochemical reaction." Electron transfer between proteins is the cornerstone of biological energy transfer. Every life-form uses this process to convert food or sunlight into chemical energy. The interdisciplinary team of researchers found that the electron travels over a bridge made of a water molecule, while residues on one of the proteins form a sort of 'molecular breakwater' to keep other water molecules away while the electron travels across the bridge. "You don't want too many (water molecules around the bridge) because it gets too crowded and they're all bumping into each other and you can't get one to fit at just the right position and the right angle (for the bridge) for any length of time," says PhD student and co-author Nathan Babcock. "It's like being on a crowded subway where you can't get comfortable." In artificial mutations with a faulty breakwater, the water bridge is disrupted and the rate of electron transfer is markedly reduced, he says. Using the CHARMM molecular simulation computer program, the research team examined a 40 nanosecond period of electronic coupling of the proteins methylamine dehydrogenase and amicyanin from the bacterium Paracoccus denitrificans. "This is fundamental research but you can imagine how studies like this can be applied to various genetically modified organisms, and if you can gain control over some, you can use it to either speed up or slow down a particular reaction," says Salahub. He says the work was made possible with the collaboration of two of the U of C's interdisciplinary research institutes; the Institute for Biocomplexity and Informatics (IBI) and the Institute for Quantum Information Science (IQIS). Babcock, whose background is in quantum information theory, was pleased to do research at the union of these two disciplines. "When you think of quantum mechanics, usually you're thinking solid state semi conductors, atoms trapped with lasers, etc. It's usually cold laboratory stuff, not warm globby biological stuff," says the PhD student. "I think the union of biology and quantum mechanics is very, very exciting." 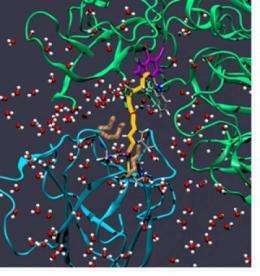 More information: "Surface residues dynamically organize water bridges to enhance electron transfer between proteins" was published on June 14 in the journal Proceedings of the National Academy of Sciences (PNAS) by Nathan Babcock et al. "I think the union of biology and quantum mechanics is very, very exciting." Very exciting indeed, I have to agree. Especially seeing that photosynthesis and the sense of smell have already got strong links to quantum mechanisms. All at room temperature. Especially exciting is the quantum entanglement that's been proposed as the active mechanism in photosynthesis. We're in for an exciting ride...!